To make the candied chestnuts, heat a non-stick frypan over medium heat. Add sugar and butter and stir until butter melts. Add chestnuts and cook, stirring for 4-5 minutes until chestnuts are golden brown and evenly coated. Transfer to a baking tray lined with baking paper. Separate chestnut pieces and leave to cool. To make salad, using a V-slicer or sharp knife, very finely slice fennel. 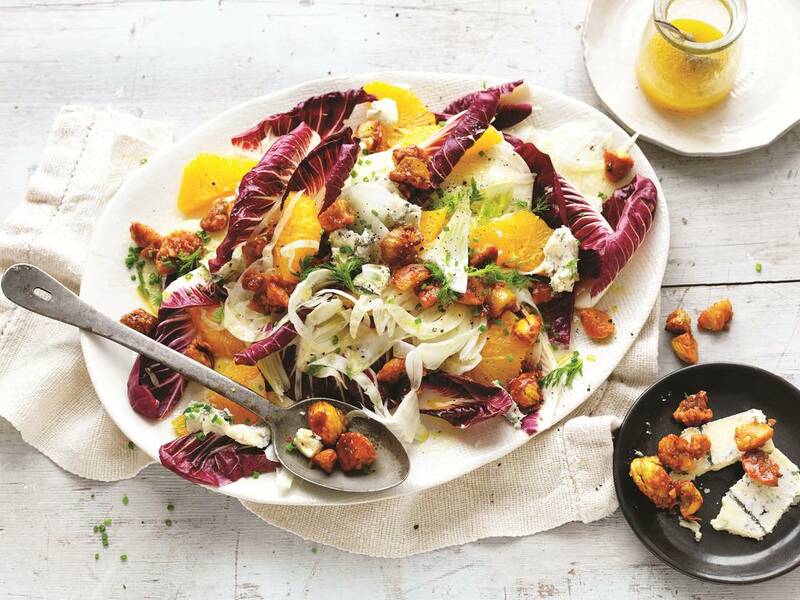 Arrange fennel, radicchio, Gorgonzola and oranges on a serving platter. Sprinkle with candied chestnuts and reserved fennel fronds. Drizzle with extra virgin olive oil, season and serve with crusty bread.